NEWTON, Mass. – Taunton may have been the top seed heading into Thursday night’s South final at Newton South, the undefeated team having its best season in program history, but the Tigers were squaring off with Needham, a perennial power that had won the past three sectional titles and was only two years removed from winning a state championship. The Tigers (20-1) had the energy and the excitement of a program on the rise, but it turned out that the experience of having played, and won, on this stage many times before was too much to overcome. Needham won its fourth straight South crown with a 3-0 (25-16, 25-20, 25-11) sweep, although the match was closer than the final score indicated. In the second set, Taunton led 18-15 and seemed to be on the verge of getting back into the match, but Needham ran off six straight points to grab the lead, the momentum, and eventually the control of the match. At the start of the match, Taunton seemed rushed. The Tigers were obviously excited about the opportunity and making uncharacteristic mistakes. Passes were just a little off target, blocks were a little too close to the net, and the Rockets seemed to take advantage of everything. Following a Lance Law ace, Taunton trailed just 8-6, but Needham rattled off 12 of the next 16 points to extend the lead to as many as 10. To that point in the set, the Tigers had only two kills, one from Lens Esquil and the other from Collin Hunter. Law had a kill and Marc DeSousa had a block for a point, as Taunton grabbed a little bit of positive play right at the end of the set and the Tigers carried that over despite falling behind in the match. They came back onto the court for the second looking much more composed and confident. Taunton jumped out to a 7-1 lead in the second, behind hits from Law, Esquil, and Hunter. Needham answered with four straight to cut the lead to three, but Esquil again took a perfect pass from setter Ricardo DaFonseca, who was also a standout defensively throughout the match, and blasted the Tigers in front by four. Things went back-and-forth for the next few points, with Needham getting back within one on six different occasions, but Law and Esquil always seemed to find a hit that kept Taunton in front. After a DaFonseca kill and a hit that went long, Needham took a timeout trailing 18-15. It turned out to be the moment that would seal the win for the Rockets. Needham came out with two kills by Jack Cruickshank and one from setter Eli Wallace to tie the set. The Rockets scored the next three points before a Malik Charles kill ended the run and Gage Kingman managed to drop a shot in between the entire Needham defense to make it 21-20. Cruickshank and Cam Robins fired Needham to four straight points and a 2-0 lead in the match. The Rockets made sure that there would be no three-set comeback from the Tigers. Needham took a commanding 8-1 lead in the third and really never looked back, closing out the match with a dominant set. There were moments of energy from Taunton, such as Charles smashing a point down the middle, but the Rockets led the set throughout. Regardless of the result in the South final, this was the best season in program history for the Tigers and one that Chaperon believes could build for the future. “It was fantastic. What a great ride,” he said. “They’re one of the best groups of guys I’ve ever been able to coach. Not only are they great volleyball players, they’re great citizens, great students, and they went through their tie where it was a rough road for a couple years, but look what happens. TAUNTON, Mass. 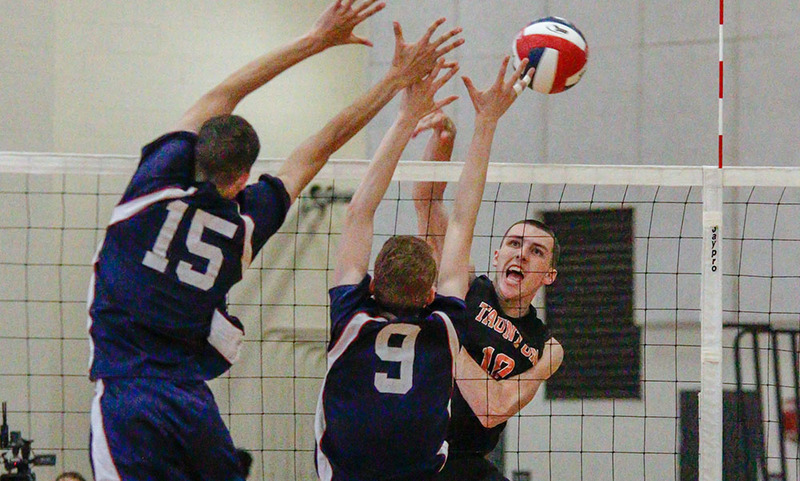 – Most of the boys’ volleyball teams in the playoffs boast a strong outside hitter-middle combo, but not many have the complementary and depth pieces that the top-seeded Taunton Tigers possess. 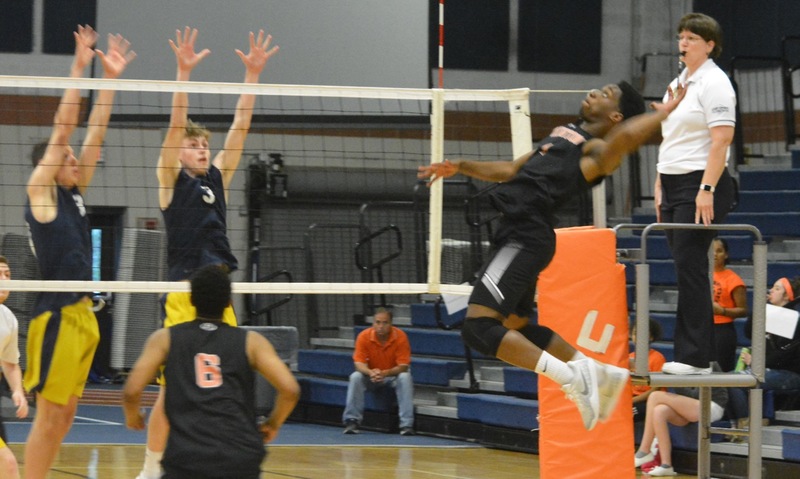 While seniors Lance Law and Lens Esquil spearhead the Tigers attack, classmates Collin Hunter, Malik Charles, and junior Alex Tavares complete a relentless attacking corps, one that helped the hosts pick up a 3-0 (25-19, 25-18, 25-15) sweep over ninth-seeded Brookline inside the Rabouin Field House at Taunton High School. The result marked the program’s first-ever playoff win at home. Law (nine kills) gives the Tigers flexibility with the ability to hit as an outside hitter or an opposite and Esquil (10 kills) provides power up the middle. But when the Tigers rotate, there isn’t a soft spot in the lineup. Hunter (eight kills) is dangerous as an outside hitter, Charles (five kills) can hit in the middle or outside, and Tavares is a presence at the net at 6’4. In the opening set, neither Taunton or Brookline could create separation early on. Esquil landed two kills before hitting an ace to give the Tigers its largest lead at 19-16. Law came up with a big block on Brookline’s top middle Eric Chabon to give the Tigers a 22-17 lead. Hunter added a late kill before an error gave the Tigers a 25-19 win. The second set mirrored the first set with no team leading by more than two points until late. Esquil had his best set in the second, planting a kill after a nice back set from Ricardo DaFonseca (32 assists) to give Taunton a 17-16 lead. Brookline came back to tie it at 18-18 but the hosts closed with a 7-0 run with Esquil (two blocks, two aces) landing an ace for the final point and a 2-0 lead. The Tigers’ relentless attack paid dividends in the third set as they were able to build the separation easier on. Hunter dropped in a tip kill, hit another one that just fell in after Esquil made a nice play to keep the ball up after a block, and Hunter put an exclamation point on a 13-3 run with a kill that split a pair of blocks. Brookline got the deficit down to seven but back-to-back kills from Charles put an end to any comeback hopes and Taunton sealed the victory with a 25-15 win in the third set. Gage Kingman finished with 10 digs for the Tigers. Taunton boys volleyball (19-0) will take on the winner of #4 Greater New Bedford (16-4) and #5 Newton South (15-4) in the South semifinals on a date still to be determined. KINGSTON, Mass. – Barnstable had advanced to at least the Division 1 South semifinal every year since 1989, including 20 sectional titles and sixteen state championships. Taunton was appearing in its first D1 South final. The Tigers won 15 matches this year, more than the past three seasons combined. The Red Raiders have not been held to fewer than 15 wins since 1988. Experience was clearly on Barnstable’s side in the D1 South final Saturday night at Silver Lake High School as they ended Taunton’s magical run through the tournament with a quick three-set win. Taunton defeated #10 Plymouth South, #2 Mansfield and #3 New Bedford en route to the final after finishing fourth in the Kelley-Rex Division during the regular season, an important milestone for the program. From the first serve, Barnstable’s experience presented itself clearly to the Tigers. Tied 4-4 in the first set, the Red Raiders won eight points in a row to open a 12-4 lead. Two kills by senior Emily Moor brought the Tigers within five before a 6-0 Barnstable run created enough separation for a 25-15 opening set victory. Taunton started strongly in the second frame, with Moor and senior Aimee Kistner recording kills and Meghan Navarro adding an ace for a 7-5 lead. But Barnstable quickly responded with another impressive 6-0 run as senior Ashley McCarthy set up kills for teammates Riley James and Megan Dombrowski. Taunton climbed back into the set with a pair of kills from junior Sam Reaume and senior Alyssa Gibson, but Barnstable slowly broke away for a 25-12 win and a two-set advantage. McCarthy and sophomore Caroline Brodt silenced Taunton in the third set to seal the win. McCarthy had six assists, a kill and an ace in the set while the Red Raiders won eleven consecutive service points from Brodt, including two aces. In addition to the 23 helpers, McCarthy added six digs and four kills for Barnstable. James led the Red Raiders with 12 kills while Danielle Derosier had nine digs and four aces. Brodt also finished with four aces and Sollows had ten kills in the win. Taunton senior Molly Sullivan had a match-best 15 digs while senior setter Tatum Speicher had a team-high 12 assists. Moor recorded six kills and Kistner added 10 digs for the Tigers. Barnstable, winners of six-straight sectional tournaments, will face Concord-Carlisle in the Division 1 state semi-final as the program searches for its 17th state championship in 22 years. MANSFIELD, Mass. – The crowd was packed into the stands on both sides of the net, hurling taunts and cheering on their respective teams. It was an atmosphere that the boys’ basketball teams would be thrilled to get this winter. The home half of the crowd was noticeably quieter in the third set, as Taunton took control. The Tigers, who already led the match 2-0, took a 14-6 lead after a strong serve by Alyssa Gibson (five kills, two blocks). The wheels had come off for the Hornets and the season seemed destined to end. However, the first-time league champions would lay down and let the season end without a fight. Meg Hill (10 kills) had a pair of blocks and three massive kills from her spot in the middle and Sarah Mullahy added two kills. Jessica Haradon won a service point and suddenly it was 20-20 and the noise in the Albertini Gym was deafening. Twice Taunton got within a point of the win and twice Mansfield held on. Finally, Molly Sullivan hit a dipping serves that the Hornets could not return and the Tigers took the third set for a 3-0 (25-21, 25-19, 29-27) victory and advanced to the Div. 1 South semifinal. The Tigers came into the game looking to generate more offense than what they achieved last time out against the Hornets. Mansfield swept that match 3-0, so Chaperon moved Aimee Kistner from the middle to the outside to get more offense going. It worked and Kistner led the team with 11 kills and added eight digs. Early in the game it was Gibson that provided the spark with several big blocks and kills in the middle and Sam Reaume and Emily Moor chipped in with big plays. 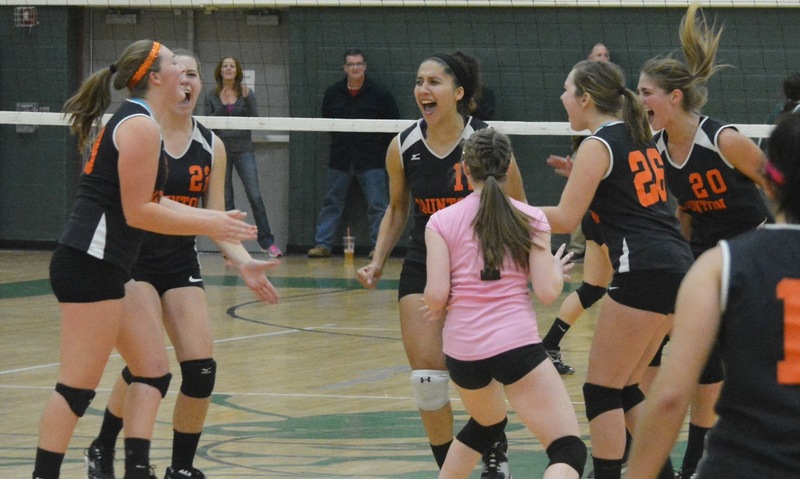 The balanced attack at the net made Taunton difficult to matchup with. Mansfield coach Melissa Heeden thought her team started well enough, with Mullahy having a strong first set, but then the passing slipped and the hitting dropped as a result. She also credited a strong Taunton defense, which was led by Sullivan and Meghan Navarro who combined for 10 digs. In the third set, Heeden turned to her seniors to lead the team. As she talked about the senior class, the coach struggled to hold back tears and noted that the group of six players was still huddled together by the net well after the match had ended. In the midst of the loss, senior setter Cathryn Heavey reached a milestone. She had 27 assists in the match, which moved her past the 1,000 assist mark for her career. Her counterpart Tatum Speicher had 26 assists on the night. Chaperon likewise appreciated the opportunity to coach in this type of game. In his 10th year in charge, this is the first time that he has had a team reach the postseason. Taunton will travel to New Bedford on Thursday in the Div. 1 South semifinal. The Whalers swept the season series. 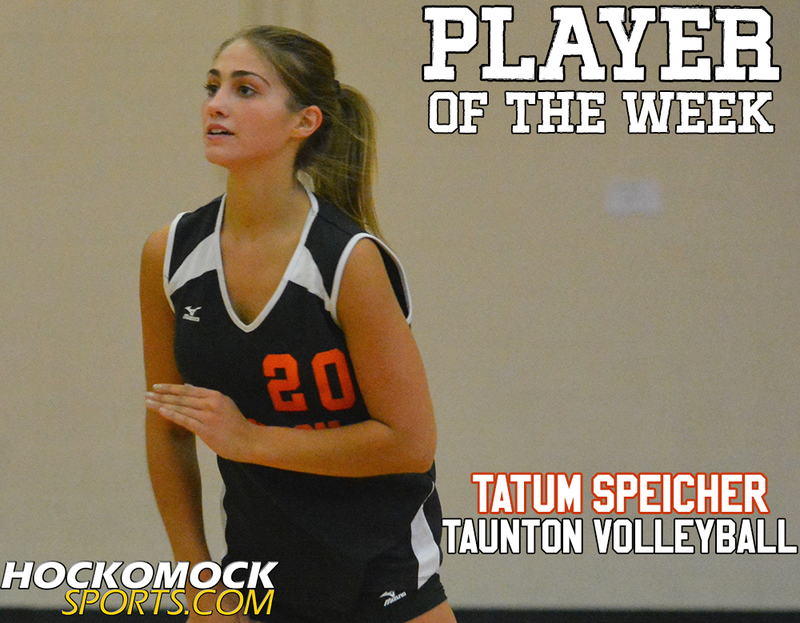 Taunton senior setter Tatum Speicher has been selected as the HockomockSports.com Player of the Week for October 25th through October 31st; the eighth player chosen in the 2015 season and first volleyball player. 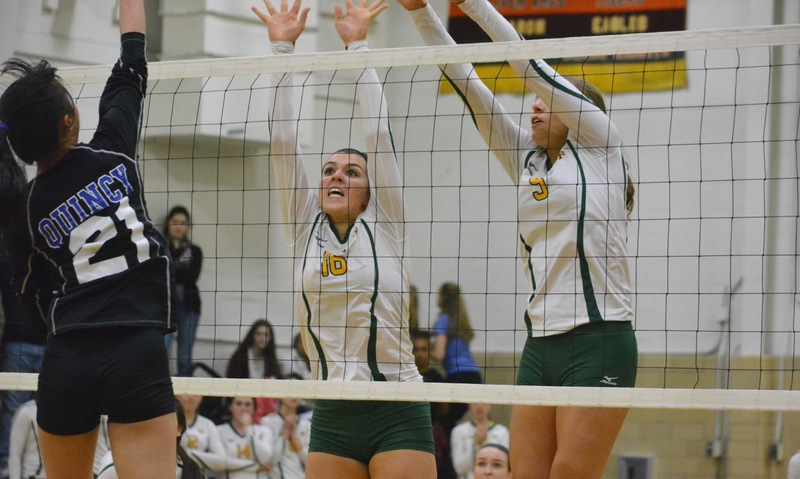 Speicher became the first player in program history to get 1,000 assists, doing so in a win over King Philip. Speicher hit the milestone in the deciding fourth set against the Warriors, an impressive bump set from off of the court for the first kill. Taunton won the match 30-28, 27-25, 20-25, 26-24 and Speicher finished with 34 assists. 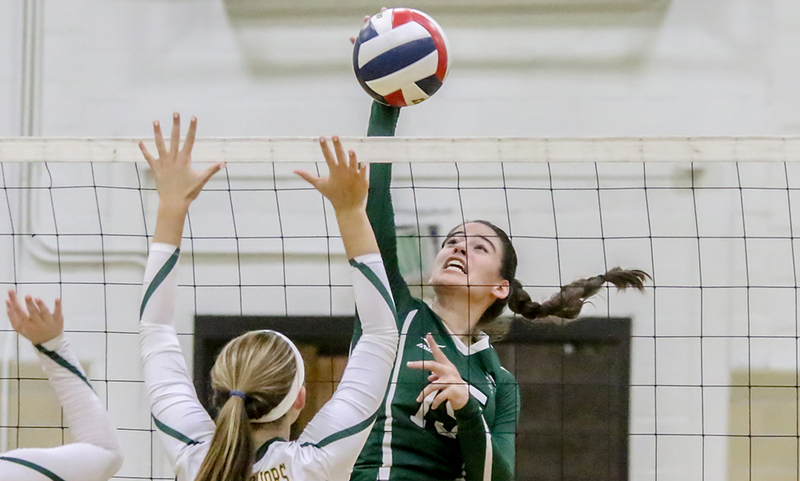 In Taunton’s second match of the week (a 3-0 setback to Mansfield), Speicher had 25 assists, five digs and a pair of service points against the Hornets. She has 1055 career assists with almost half (498) coming this Fall. “She also has fun as she is usually smiling and using that positive energy to keep her teammates loose,” Chaperon said. Taunton finished the regular season 12-8 in what was the most competitive Kelley-Rex division since the split and one of the toughest seasons in the past decade. The Tigers qualified for the postseason for the first time in over a decade.